A YUGE controversy arose over Melania Trump’s Republican convention speech, when she repeated some things that Michelle Obama had spoken eight years earlier. Melania was roundly accused of plagiarism. Her expression of those ideas was much the same as Michelle’s in 2008. What Melania is being chastised for, however, happens pretty often – people frequently say or write things in a similar manner as other people – and it wasn’t an attempt to take credit for some unique ideas, as these ideas did not originate with Michelle Obama. Using phrases someone else used to express common ideas is hardly criminal. Consider this: If you are driving 27 mph in a 25 mph zone, are you speeding? Technically, yes, but from a practical viewpoint, it is essentially irrelevant. You may have broken the letter of the law, but you have not broken the spirit of the law, which is to cause people to drive slowly. At its core, the issue really is whether it makes any significant difference in the long run, and it doesn’t. The two excerpts inarguably share ideas and some of the same phrases. Could Melania and those helping write the speech have done a better job of expressing these ideas without sounding so “familiar,” and should they have? Obviously. But for this use of a few phrases to be truly relevant, those phrases would have to be special, like “four score and seven years ago …” Those phrases do not “belong” to Michelle; they are not her property. They are ideas common to many/most Americans. And First Ladies or hopeful First Ladies Nancy Reagan, Hillary Clinton, Laura Bush and Ann Romney all expressed some of those same ideas before under similar circumstances. If, on the other hand, Melania had said, “An important idea came to me the other day: Ask not what your country can do for you; ask what you can do for your country,” using those famous words spoken by President John F. Kennedy at his 1961 Inaugural without attribution would have certainly been over the line. What many or perhaps most people do not know is that according to some of Kennedy’s classmates, the headmaster at a school they attended years before spoke those words originally. Was JFK a plagiarist? Laura Bush talked about being determined and working hard at the convention in 2004. 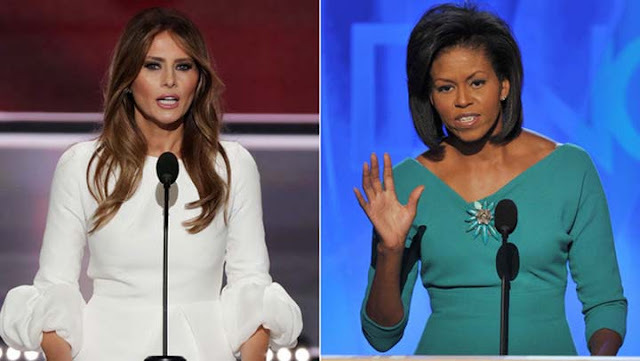 Did Michelle plagiarize her speech four years later? In 2014 Hillary Clinton also used a phrase spoken by Michelle in 2008 about hard work and passing those values to her daughter. Did Hillary commit plagiarism? There are only so many ways to express an idea or thought, and the more people that write or speak about an idea, the greater the number of times someone will write or say a phrase, a sentence or a paragraph the same way that someone else wrote or spoke it, either verbatim, or in a very similar manner. These similarities may not have been intentional, and are therefore not plagiarism. This kerfuffle illustrates the extremes to which the Left and its media lackeys will go to focus voter attention on irrelevant minutiae to distract them from the voluminous failures and shortcomings of Hillary Clinton. Just how hard is it to say "Melania did it" instead of trying to act like a Concord freshman trying to justify lifting passages from a crappy Google search? Perhaps if you read the whole commentary, and/or read for meaning you will notice that Melania is in a long line of sitting or hopeful First Ladies to use these topics in their speech, and that Michelle herself used them after Laura Bush did. Michelle is a plagiarist, too. The whole episode is an exercise of trying too hard, not investigating enough and bias in the media. But perhaps you have been infected by the liberal virus that does not allow truth to get in the way of a good Republican/conservative bashing.